Sentwali Barkari, vice chancellor, Student Success, opened the Feb. 13, 2018 Chancellor’s Town Hall. The well-being of students, faculty and staff will be the subject of discussion and interactive activities during a Chancellor’s Town Hall Feb. 5. “Creating a Culture of Well-Being” will be presented by the Division of Student Success and Vice Chancellor Sentwali Bakari from 10:30 a.m. to noon in Berger Hall. 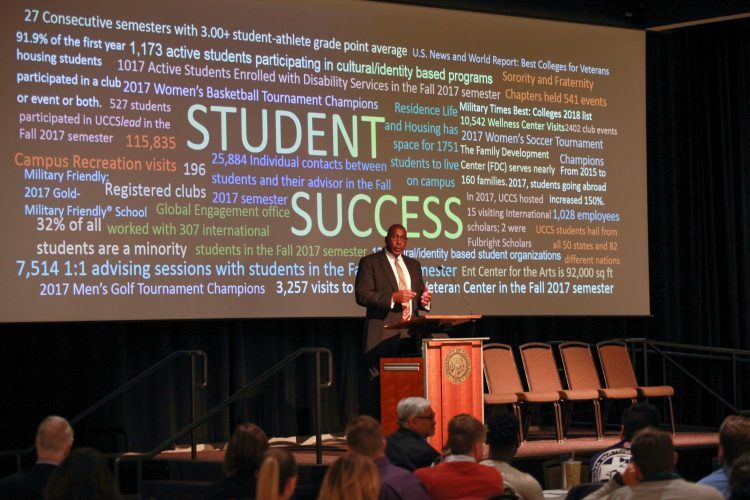 Feedback from the division’s 2018 town hall included the need of well-being on campus, and the division’s new strategic plan included well-being as one of six goals. This year’s town hall will include small group activities on the range of services at the Recreation and Wellness Center and discussion about the current initiatives on campus, within the CU system and in the Colorado Springs community. A mini health and wellness fair will be available after the formal program for attendees to learn more about the range of services and initiatives on campus. Faculty and staff are encouraged to confirm attendance to rsvp@uccs.edu.